There’s a little clock in my head that starts ticking when I have been spending too much time trying to get a program to work. And that little clock was ticking furiously by the time I got this screenshot. 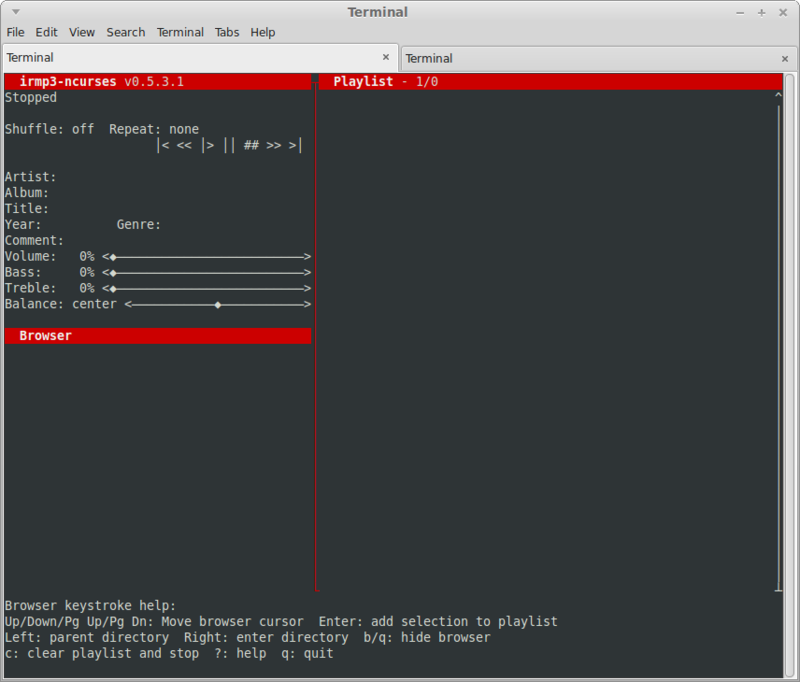 That’s irmp3-ncurses, a text-based front-end to the irmp3 audio jukebox. And believe it or not, after more than an hour of scraping around in two different distros, that’s the best I could come up with. As I understand it, irmp3 is primarily aimed at environments that need infra-red support or LCD output, so … car stereos, custom-built home mp3 players, and so forth. And if you skim through a few of these examples, it’s quite impressive to see what you can do with it. So I switched to Mint, because the previous verision of irmp3* is in the Lucid (and Debian Squeeze) repositories. If the issue was a faulty setup in Arch, perhaps the Debian/Ubuntu versions carried enough default settings to get things rocking. But as luck would have it, the Mint/Ubuntu version was no more successful. Oh well, I tried. There are a few considerations, of course: The last version was released way back in 2007. I don’t have either LCD or IR hardware. And I have a long-standing reputation for butchering application conf files. Any one — or all — of those could be the problem. This entry was posted in Uncategorized and tagged audio, client, daemon, music, playback, player on 2014/09/07 by K.Mandla.